My first step in getting ready is washing my face. If I choose to shower in the morning, I normally will do this step in the shower. My favorite type of face wash is one that foams and this one from WHYLD does not disappoint. Not only does it foam better than any other wash I have used, it is all natural. I swear this makes a HUGE difference. The main ingredient in this wash is organic aloe vera. My skin is super dry and I’m so happy to find a moisturizing wash face that actually works for me. This is the first face wash I have ever used that doesn’t leave my skin feeling stripped. If I use this wash at night, I normally do, I always use DHC deep cleansing oil first to take off all my makeup. The Glossier priming moisturizer is exactly what it says, a luxurious face cream. I have not had the chance to try high end face creams but this is what I would imagine it to be. I use this day and night. It’s perfect for the day because it’s not heavy and it soaks in. Glossier says it’s a great primer for makeup and they are right. I always apply sunscreen after I wash my face and before I apply a moisturizer. When I first started shooting my outfits for the blog, I began to notice that I have puffy eyes. I purchased the Algenist Complete Eye Renewal Balm from Sephora and it has helped, almost instantly. The eye cream is light and is great for the day time. At night I use a heavier eye cream. Like my skin, my hair is just as dry. I put oil in my hair believe it or not. 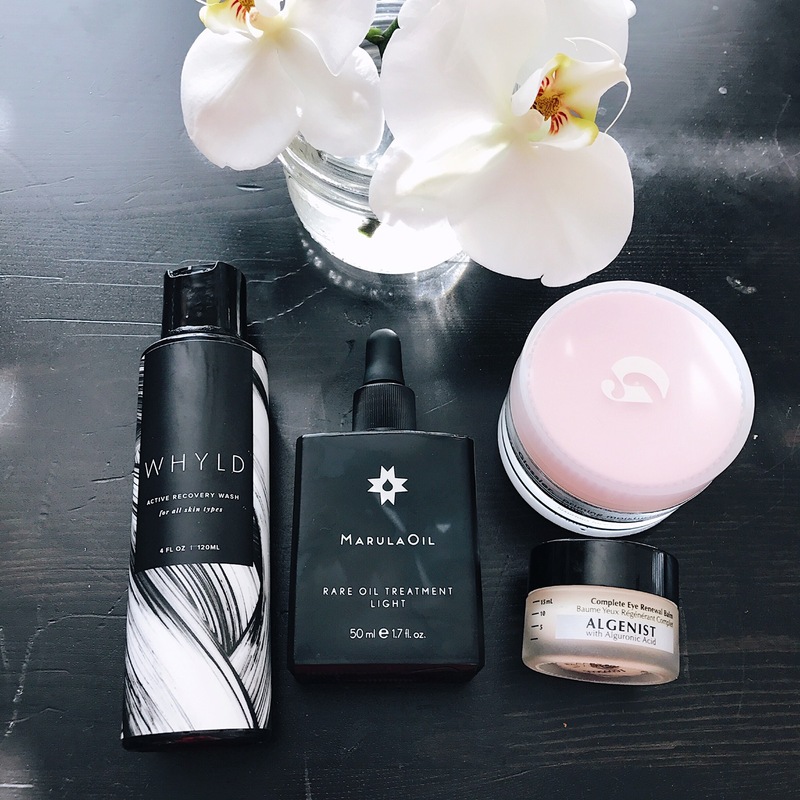 I love Marula Oil. The smell is amazing! Not only does it work great for my hair but I also will use on my face as part of my night routine if my skin is feeling extra dry. I’d love to try the Glossier face cream! You mentioned some great products. I would love to try that glossier moisturizer and the eye cream. When it comes to cleanser, seriously not a huge fan of foaming cleanser, i feel that it dries out my skin. I wanna try these so bad! I love your skincare routine. Gosh, that Glossier face cream has been in my wish list since it was first launched. I can’t wait to get my hands on it once they start shipping to Canada.